Updated November 1, 2016 – Anthem Plus by Audibel hearing aids are powerful hearing devices with advanced features to deliver enhanced speech hearing and understanding, with less distracting background noise. These devices allow users to move seamlessly between widely varying listening environments, without having to make numerous manual adjustments to them. 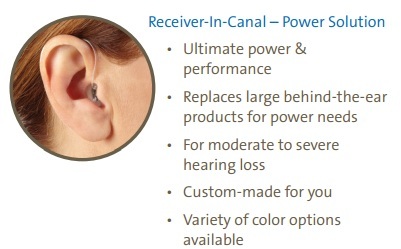 The Audibel Anthem Plus hearing aids come in a variety of styles, including Invisible-In-The-Canal (CIC), Completely-In-The-Canal (CIC), In-The-Canal (ITC), In-The-Ear (ITE), Receiver-In-The-Canal (RIC), RIC Power, Behind-The-Ear (BTE), and mini BTE styles. 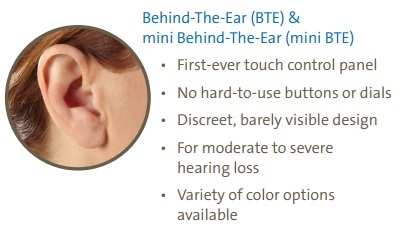 The RIC and BTE models are also available in numerous colors, so users can find the hearing aid that is just right for them. Additionally, the Anthem Plus hearing aids are available in four different performance levels: the Platinum, Gold, Silver, and Bronze. The Anthem Plus Platinum series hearing aids are designed to deliver excellent performance in noisy environments where hearing can be more difficult. 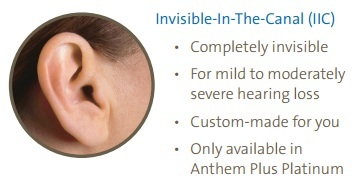 Anthem Plus Gold hearing aids are designed for difficult, loud hearing situations. Anthem Plus Silver hearing aids are designed for less difficult hearing situations. Finally, the Anthem Plus Bronze hearing aid, although packed with advanced features, performs best in quieter, less difficult sound environments. WhistleFree Feedback Cancellation: This advanced feature eliminates whistling or buzzing in the user’s Anthem Plus hearing aid before he or she even knows it has occurred. Without this buzzing, users can make much more pleasant phone calls to their friends and family. Active Noise Control: This noise-cancelling technology is designed to reduce the user’s listening effort, by reducing unwanted background noise, while maintaining speech understanding. Superior Speech Locator: This feature automatically pinpoints what the user wants to hear, and minimizes what he or she does not. This, in combination with the hearing aid’s Active Noise Control feature, can help make in-noise conversations much easier. Automatic Telephone Response: This feature detects when the user is on the telephone, and instantly and automatically adjusts the Anthem Plus hearing aid’s settings accordingly, providing users with the best sound quality possible. 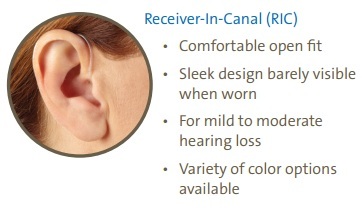 Television Processing: This feature allows the user’s hearing aids to automatically adjust to the user’s preset television listening settings that are most comfortable for the Anthem Plus wearer. T2 Remote Control: This technology allows users to treat any touch-tone telephone as a wireless remote control for his or her hearing aid. 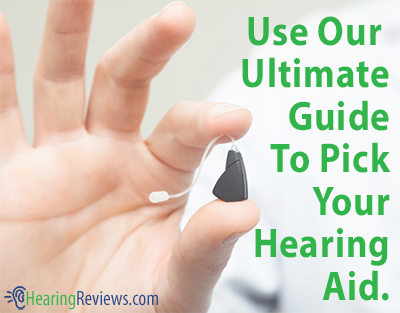 Users can make easy and convenient volume or memory mode changes to their hearing aids. 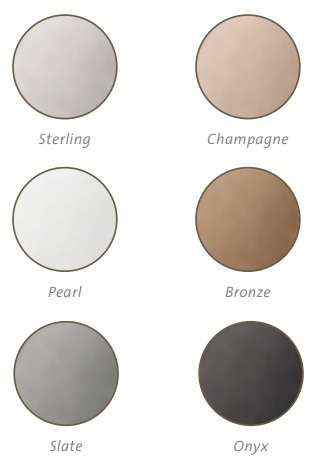 Advanced HydraShield: This advanced nanocoating technology provides a barrier from sweat, wax, oils, humidity, and corrosion that can be harmful to the performance of the Anthem Plus hearing aids. 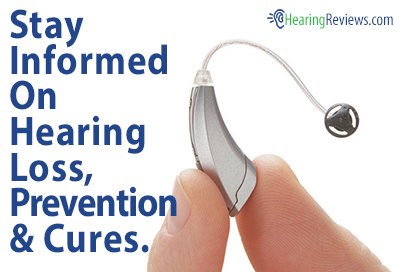 This feature provides the hearing aids with added durability. EZ Touch: This feature lets users make easy manual adjustments to his or her hearing aids with just the touch of their finger. With the Anthem Plus hearing aids, users do not have to deal with tiny buttons and dials for making settings adjustments. Convenient Indicators: With automatic voice and tone indicators, users are always informed of the status of their Anthem Plus hearing aid, as well as its battery.